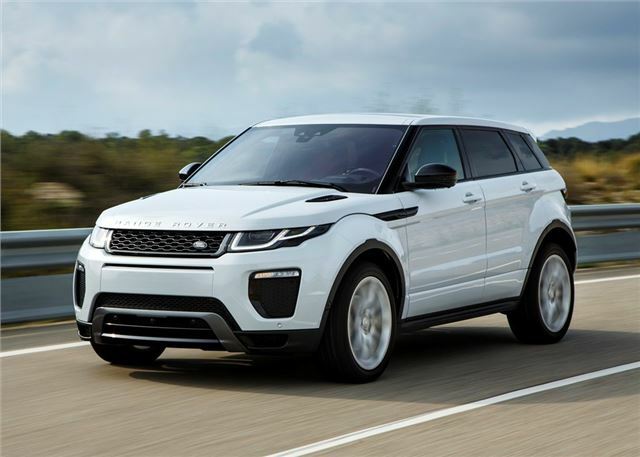 Few at Land Rover could have envisaged the colossal success of the Range Rover Evoque. Since its launch in 2011, it has clocked up almost half a million sales worldwide, which means it accounts for one in every three cars sold by Land Rover. That's not to say the updated Evoque is the same car as before. On the contrary, look under the bonnet and you'll find Jaguar Land Rover’s new 2.0-litre Ingenium diesel engine, which headlines with 109g/km of CO2 and almost 68mpg, depending on which model (five-door or coupe) you choose. The Ingenium engine is notable from the moment you press the starter switch. There's less diesel clatter, less vibration through the pedals and more low-down torque as you drive away. Depending on how quick you want your Evoque to go or tow, outputs vary from 150PS to 180PS, with the eD4 limited to the former and being the most efficient - and company car friendly - thanks to its front-wheel drive powertrain and use of low rolling resistance tyres. If four-wheel drive is more your thing then you can go for the TD4, which is offered with 150PS or 180PS. As well as more traction you also get Land Rover's excellent off-road focused Terrain Response system, which lets you take the Evoque quite literally anywhere, by using the pre-select driving modes to optimise performance on everything from mud to deep snow. The more powerful 180PS 2.0-litre diesel is the most potent and covers 0-62mph in 10 seconds plus it can tow up to 2200kg, thanks to its 430Nm of torque that flows from just 1750rpm. There’s a price to pay though, both in list price and economy, with claimed efficiency dropping to 58.8mpg and CO2 emissions rising to 125g/km. Unless you really need four-wheel drive or regularly tow a large caravan, we’d opt for the eD4 because it returns up to 67.3mpg and 109g/km, which is impressive when you consider the Evoque’s 1.6 tonne kerb weight. Regardless of powertrain, the Evoque remains a classy and comfortable drive, with impressive refinement and minimal road and engine noise. Entry-level models get 17-inch wheels as standard and goes up to 19-inch alloys, yet the large wheels don't impact the ride, which is always soft and composed. Behind the wheel the Evoque looks and feels very much the same as before, with lots of brushed aluminium and soft-touch leather. There’s still lots of head, shoulder and leg room in the front and rear, while the interior can be customised to your heart's (or wallet's) content, with the options including a panoramic roof, configurable interior mood lighting and 14-way adjustable electric seats that can be programed to cool and massage the driver. One of the areas that needed improving on the old model was the infotainment system, which we found to be slow and dated by modern standards. Thankfully Land Rover has addressed this area with a new five-inch touchscreen, with faster responses and better graphics. The driver's instrument cluster is also a lot better, with a sharper display for speed, revs and four-wheel drive settings, although the trip control can still confuse with a muddling maze of menus and settings. Another area that baffles is the economy of the automatic transmissions. All Evoques get a six-speed manual as standard, which is easy to use with short progressive changes and wide gearing, yet for some reason the new nine-speed automatic uses more fuel and emits higher CO2. This means a five-door 150PS Evoque auto will cost £20 more to tax a year and use 4.0mpg more than a manual, which is unusual to say the least. That said, the automatic works well and we doubt many Evoque customers will care that they cost a few more pounds a week to run. The biggest surprise about the Evoque is its lack of competition. Since 2011 it has proven to be a huge global hit, yet no other manufacturer has attempted to encroach on Land Rover's turf, which makes the compact Range Rover the only choice for buyers who want a luxurious crossover with high street chic. The Range Rover Evoque 2.0 Ingenium is on sale now.